Walking from station take you 5 minutes, and from Shinjuku and Shibuya (Tokyo area) to arrive here just taking one train without changes. 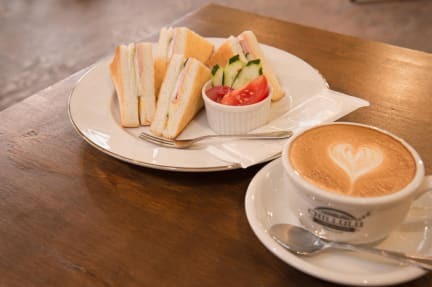 On the first floor we have a coffee shop, where you can enjoy a drip coffee, cafe latte, espresso, hotcake french, toast and sandwiches. Every room at this hostel is air conditioned and is fitted with a TV. You will find a kettle in the room. The rooms come with a shared bathroom. Loved this location in Chinatown! Super friendly and loved the free latte for every night booked! Would definitely stay here again! Friendliest staff ever!!! NOT a social hostel but definitely the best for Yokohama. Honestly had an amazing time. The staff was super friendly and the beds were comfy.the little common area was nice to sit and look out over the street while chatting with other guests! Also the coffee in the cafe downstairs was amazing. (Try the Vienna coffee, the homemade whip cream was aaamazing) Anyway, great location right in China town, really close to the station. I will definitely be back the next time I’m in Yokohama!!! I loved my stay at Chillulu, one of my favorite hostels that I've visited. Chinatown is a really fun and interesting location and having a coffee shop downstairs is super nice. The staff here was very friendly and added to the positive atmosphere. This place was awesome. Lots of room in each bed. The security box was old fashioned but effective. Everything lies on one floor. Like a giant studio. Which was nice. I would recommend getting earplugs if you are a light sleeper though. The location was nice. Smack in the middle of Chinatown. 9 min walk to the JR station and a 3 min walk to the non Jr station. I was very impressed with the staffs english! She spoke so well! Makes me want to become just as fluent in Japanese! Excellent location right next to China town and walking distance to the harbor. They also provide two free drink tickets for orange juice or coffee at their cafe, which is downstairs. Lock is provided for your locker. The beds are decent but a little squeaky, can’t really complain. There are no shelves at your bed area. It would be great if it had a tiny shelf near the night light. The location is amazing! It’s right off of the main Chinatown road, and only a short walk from the park and the ocean, I love that they give you a free coffee ticket, and the fact that they front desk was super helpful when I was asking for suggestions on places to go. One thing I didn’t like though is the way it’s setup, made it hard to meet people and make new friends. 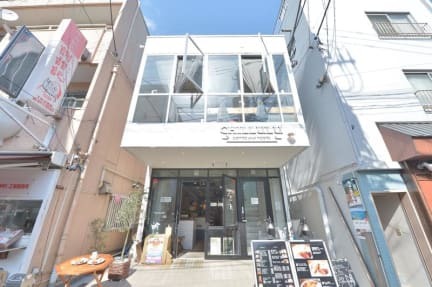 The hostel is right in the middle of Chinatown and next to the harbor parks and close to Motomachi. There are tons of things to do within walking distance, and you get a free coffee drink at the coffee bar downstairs. Unfortunately, the entire hostel is just one long room with the common area, beds, kitchen and bathrooms packed all together. It's really noisy and brightly lit at night (why do Japanese girls blow dry their hair at 1am?). I'm normally a sound sleeper, but I slept fitfully. It wasn't bad. There is no common area, other than the cafe down stairs (but that envolves purchasing cafe priced things). No bowls in the very small self catering area, no stove either if you wanted that. Its a bed, not that cheap. But being in china town was nice.